Anoplophora chinensis and A. glabripennis, two longhorned beetles, are natives of Asia and are considered some of the most dangerous woodborers worldwide. Their infestations often go undetected for several years, allowing both species to colonize new areas undisturbed and reach population levels which are difficult to eradicate. In Italy, A. chinensis was first detected in 2001 near Milan, and in over a decade the Lombardy Plant Protection Service (PPS) has developed enough experience to contain this xylophagous pest. Thanks to these efforts, the Lombardy PPS staff realized that public awareness is pivotal for a successful and effective eradication program. 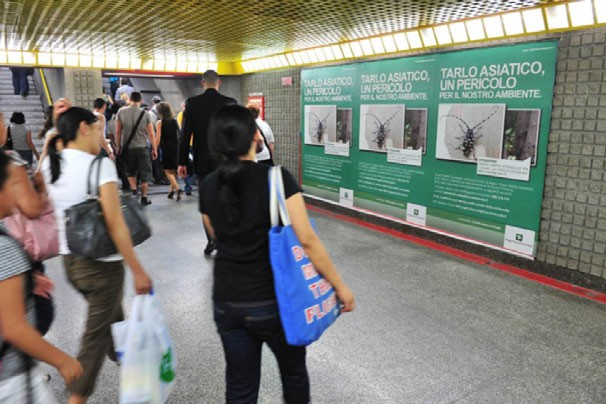 Since the beginning of the infestation, the Lombardy Region has mounted a notable campaign of information through communication media designed to inform residents of the problem. The tools used have yielded interesting results. 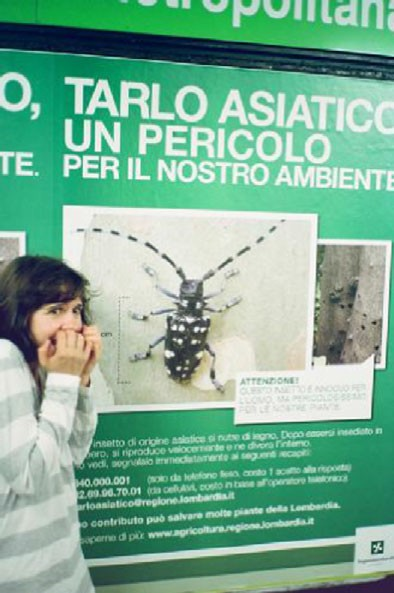 glabripennis (Asian longhorned beetle) are two species of longhorn beetles, invasive organisms originating from Asia. glabripennis spreads through wood packaging materials (WPM). Several outbreaks of A. glabripennis and A. chinensis have been detected in North America and Europe starting in the late nineties. The number of reports has been increas- ing in recent years and also in recent months. The outbreaks are always located in urban areas, with serious damage to gardens, avenues, parks and urban forests. These insects damage the plant by boring galleries inside the wood, which weakens the plant and provides access ways for other pathogens (e.g. fungi, bacteria, viruses). These pests damage the productive-commercial system due to impacts on commerce in the host plants. The finding of an outbreak of Anoplophora chinensis causes several constraints on the marketing of host plants, resulting in severe economic losses. glabripennis and A. chinensis could penetrate large forests, causing significant environmental damage. The financial cost of controlling these insects is high. For example, from 2001 to 2013, the Lombardy Region felled over 25 000 trees and spent almost 18 million EUR. These insects are quarantine pests in the EU (Annex I/ AI listed) and EU countries in compliance with the inter- national law, must adopt all necessary measures against them, such as cutting down infested trees, insecticide treatments and territorial surveillance. A. glabripennis is also on the EPPO A1 List and A. chinensis is also on the EPPO A2 List of pests recommended for regula- tion. It often occurs that their infestations go undetected for several years, allowing both species to colonize new areas and reach population levels which are difficult to eradicate. Therefore, early detection is essential. Because it is impossible for the PPS to check all poten- tially infested plant, it is very important to inform not only subjects directly involved with the problem, such as researchers, officials and parks and municipal staff, but also all the residents, urging them to report any suspected presence of these insects to the PPS. 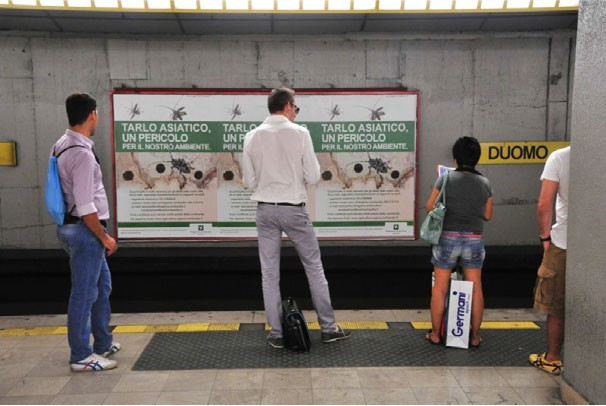 Since the beginning of the infestation, the Lombardy PPS launched a campaign through communication media designed to provide residents with information about the problem. Municipalities infested by the pest played an active part in this information effort. The communication campaign is repeated every year and the message is: ‘Anoplophora is not a threat to humans, but it is a serious threat to plants and the environment. So if you see an adult or a sign of the presence of this insect, you should call the PPS’. Leaflets and posters on A. chinensis were distributed, and a voice-mail and e-mail box were also activated. Meetings with municipal technicians and residents were organized and articles were published in newspapers, magazines and scientific journals. For the first time a TV advert was cre- ated on this topic and broadcast. A brief documentary has been posted on YouTube to inform viewers about the threat posed by this insect and to illustrate the activities of the Regional PPS. times by people taking the trains in 58 underground stations (Figs 1 and 2). The Anoplophora advertising campaign has gone viral, because teenagers have posted some pictures and posts on this topic on social networks (Fig. 3). The surveillance carried out by residents has been very effective. Table 1 shows the number of telephone or e-mail contacts received by PPS. In 2011, the number of contacts decreased slightly as the funds for communication became available only in late summer and this had a negative impact on the effectiveness of the communication campaign. chinensis and thanks to the same information campaign, the first sighting of A. glabripennis in Italy was confirmed. 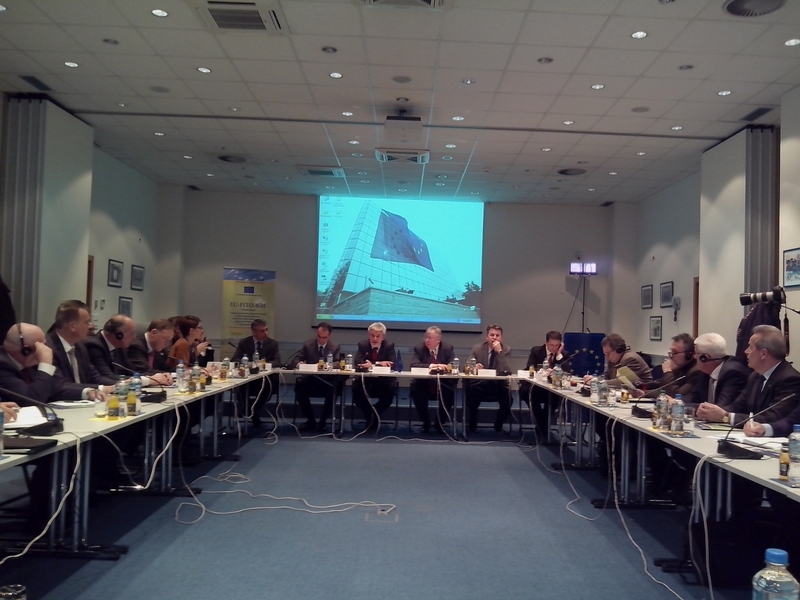 The Lombardy PPS considers public awareness an effec- tive surveillance tool, as mentioned in ISPM no. 6. In planning communication campaigns in the coming years, the Lombardy PPS has been trying to identify the most effective tools. To get feedback, the PPS interviewed 351 people in seven different places in Milan. Forty nine percent (49%) of respondents knew of Anoplophora, a good result considering that among those interviewed there were 49 for- eigners, in Milan just passing through for business or leisure: if they are excluded, the percentage rises to 57%. Forty three percent (43%) had seen the posters in the underground sta- tions, while only 14% had seen the posters in other places. Twelve percent (12%) claimed to have seen the advertise-ment on television; the reason for the relatively low success of this tool can be attributed to the fact that the advert was broadcast on local TV stations only, with low audience shares, since the initiative was not shared nationally. The advert was seen in newspapers and magazines by 6% of respondents. Table 2 summarizes the responses received. More feedback came from contacts received by phone calls and e-mails at ‘the back office Anoplophora’. Two hundreds and fifteen (215) people claimed to have received the information through the tools listed in Table 3 (each person could declare only one source of information). These investigations indicate a good performance of the communication campaign in underground stations and lim- ited effectiveness of the adverts in the newspapers and broadcast on local television stations. Public awareness is a key factor for a successful and effective eradication program, because it is essential for early detection. The Lombardy PPS has requested and obtained from the European Commission that the costs of the communication campaign be made eligible for solidarity dossiers, so public awareness has been recognized as a phytosanitary measure. 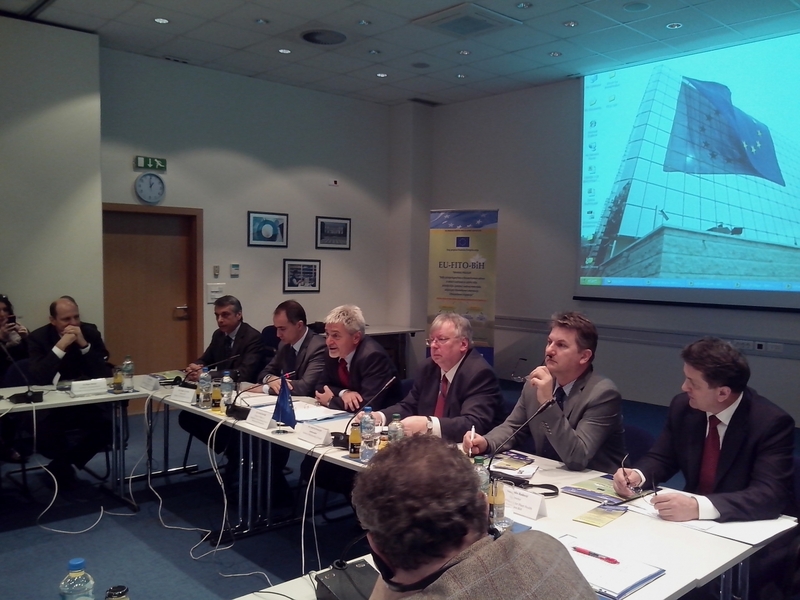 New European Commission emergency decisions require Member States to carry out public awareness. This experience shows that an active role of residents is crucial to preserve green areas and biodiversity and to pre- vent environmental and economic damage caused by pests.